Truck Driver Plows Over Peru's 2,000-Year-Old Nazca Lines, Leaving 'Deep Scars' : The Two-Way The driver reportedly said he didn't know the area because he had never traveled there before and that he left the road owing to a mechanical problem. But some think he was trying to avoid a toll. A semitrailer driver ignored warning signs and drove over Peru's famous Nazca Lines on Saturday, causing significant damage to the UNESCO World Heritage site. The lines were scratched into the ground approximately 2,000 years ago and depict animals, plants, imaginary creatures and geometric figures miles long. 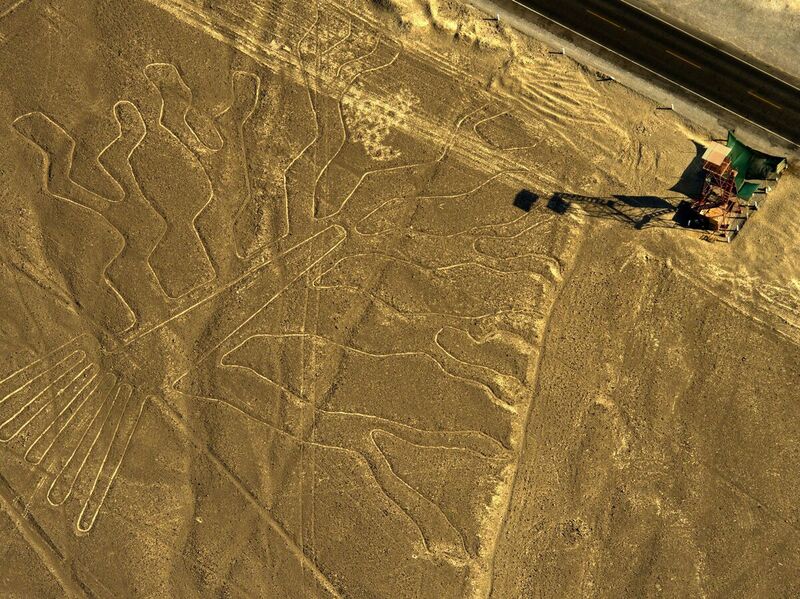 Nazca's lines and geoglyphs stretch across an area of about 280 square miles. A magistrate concluded that there wasn't sufficient evidence to indicate the driver acted with intent, Peru21 reports. Peru's public minister announced that Nazca's prosecutor's office was appealing the judge's decision. The ministry had sought nine months of preventive detention and a $1,550 fine while the investigation continues, according to the newspaper. The rig left "deep scars" across a 50 meter by 100 meter (164 feet by 328 feet) area, the Culture Ministry said, affecting the surface of the ancient site and damaging three of the geoglyphs. Argentine newspaper Clarín reports that the driver said he didn't know the area because he had never traveled there before and that he left the road because of a mechanical problem. The newspaper speculated that the driver actually drove off the Pan-American Highway to avoid paying a toll. UNESCO says the Nazca site is "the most outstanding group of geoglyphs anywhere in the world and are unmatched in its extent, magnitude, quantity, size, diversity and ancient tradition to any similar work in the world." This isn't the first time people have damaged the site. In 2014, Greenpeace activists left footprints as they planted a message there in advance of U.N. climate talks in Lima. An earlier version of this story incorrectly said the affected area was 104 feet by 328 feet. The area is 164 feet by 328 feet.